Wall anchors are something like insurance policies. They ensure that the wall can support whatever is intended to hang on it and other loads, regardless of how heavy the hanging is or the material the accessory is made of. This can make selecting the right fastener something of a tricky challenge. The scope and specifics of the entire project, as well as the hanging and the wall, must be taken into consideration. The type of anchor for your project will depend on the wall material, the weight of the load being hung, and how it can be installed and removed. Other considerations matter, too. Some anchors require special tools to install or "set." Chemical anchors shouldn't be installed in cold weather, something to keep in mind if you're working in a northern clime. Many won't work for overhead applications, and bottom-bearing anchors can't be used in holes that exceed their depth. This list of the most commonly used wall anchor types and their applications can help guide you. This type of anchor is best used for attaching cement board to wood and steel. It can also be used with high-density exterior sheathing and for bathtub attachments, countertops, flooring applications, and more. Be sure to look for corrosion-resistant fasteners. Expansion anchors, also called wedge anchors, are used with concrete, masonry, and more. They're designed to spread open once they're anchored, thus their name. This provides a stronger hold. The three basic styles of wedge anchors are fully threaded, partially threaded, and the full-bodied wedge anchor. Plastic expansion anchors are the most commonly used anchor type. The more heavily "ribbed" anchors will give the greatest gripping strength regardless of the wall material. Hollow wall anchors are used for medium-duty applications. They'll normally add permanent screw threads to any material to which they're attached. These types of anchors also expand as the screw is tightened and driven into the cavity. This anchor can be installed using a hammer or a drill and can be used with various wall thicknesses. These anchors are also sometimes known as Molly bolts, and their maximum holding load is about 50 pounds. Plastic hollow wall plug anchors require that you first drill a pilot hole. They're normally used in drywall or plaster for light-duty applications. When the screw is installed, the plug will expand and lock into place. This type of anchor is recommended for medium-duty applications and is very easy to install. These anchors can be plastic, nylon, or zinc-coated. One of the best advantages of this type of anchor is that it can be removed and reused at another location. The threads cut deep into the material, providing a secure hold and pull-out resistant grip. The large threads are intended to hold firmly in drywall and will accept #6 or #8 sheet metal screws. Toggle bolts are the traditional anchor method. This type of anchor has two parts: the toggle and the machine bolt. 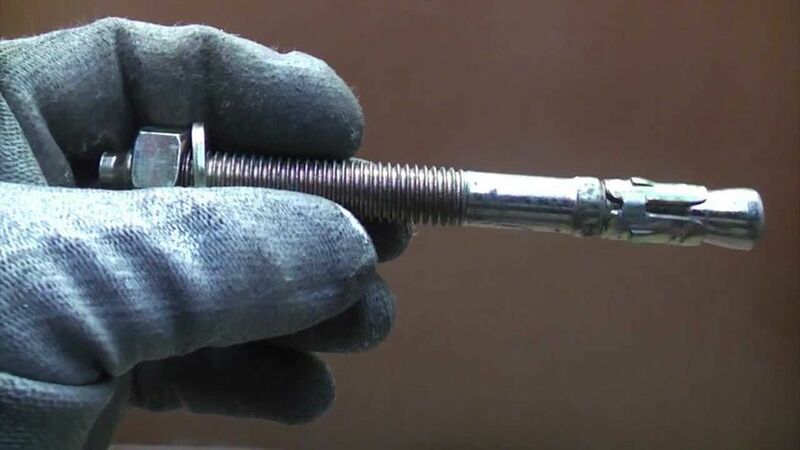 Toggle bolts are sized by the diameter of the screw and its length. As the bolt becomes larger, the toggle will also increase in size, and as it gets longer, the more it can accommodate a thicker wall. Toggles can be the preferred solution for heavy items and are available in both square and slot-drive. They require a pilot hole, and the wings that lock into place behind drywall provide strong holding power. Winged plastic anchors are used for medium-duty applications and require pilot holes as well. A special tool is used to expand the wings after the anchor has been inserted. They offer twice as much strength as regular plastic expansion anchors. A special pointed tool is supplied with the anchor to push the center of the wings out so that they properly expand inside the wall. The anchor won't function properly unless this is done, even though it might feel strong when it's screwed in. The wings are pulled firmly against the wall after the screw is installed. Plastic anchors should be installed carefully to prevent them from being damaged. They can hold between 25 and 35 pounds each when used in drywall. Spring anchors actually hold expansion springs to help support the weight the springs are bearing. They secure both ends of the springs, allowing for easy adjustment of the extension. They use a standard, threaded hole and are available in at least four types depending on the manufacturer: swivel hole, fixed hole, multiple groove, and single groove. Known for their convenience as well as ease of implementation, spring anchors do all this without being prohibitively expensive, which is always a plus. These anchors are often used in high-traffic infrastructures, which should give you an idea of how strong they are. They serve equally as well in home improvement projects and in construction. The adhesive is typically epoxy-based, and these anchors work with rebar and both threaded and smooth dowels. They also hold up under almost any climate, moisture, or weather conditions. Sleeve anchors work best with masonry and concrete fixtures and foundations. You must drill a hole for the anchor first, and the size of the hole should be a very close match to the size of the anchor itself. As the screw is tightened into the hole, the sleeve will expand. These anchors can typically handle heavy loads and a wide variety of hangings, from steel to wood as well as concrete. Most anchors fall into one of seven categories. They're either sleeve anchors, drive anchors, internally threaded, externally threaded, hollow wall anchors, screws, or they're masonry screw and pin fasteners. These basics cover most project specifications, but you might also consider environmental factors when narrowing down your needs.